You decide not to play Bastille Battalion right now. You open the hatch and crawl outside. The air smells good after so much time stewing in your own gamer-funk. Occurs when using a Bastille Battalion control rig or Bastille Battalion control rig loaner voucher. 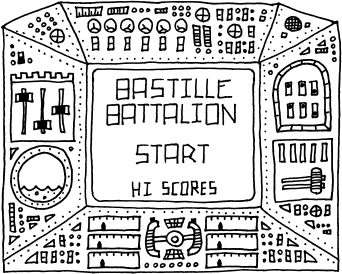 Takes you to a control panel when you can play the mini-game Bastille Battalion. The objective of the mini-game is to collect cheese curds over a number of "matches" played against an opposing castle. Each match consists of 2 building/collecting turns followed by a face-off turn. Matches continue until you lose a face-off with the opposing castle. After losing a face-off, the game ends and you are given the opportunity to "lock-in" your score. You are allowed to play 5 games per day, but you can only "lock-in" your score once per day. If you ascend you are allowed another 5 games, but a score that you locked in before you ascended is discounted (whether or not you lock in a new score). Rewards will also be given after your first play-through, depending on the settings chosen. The 4 selectors surrounding the main play area can be used to adjust your starting stats (as displayed on the dials at the bottom) and choose which rewards you get. The 6 stats are Military Attack (MA), Castle Attack (CA), Psychological Attack (PA), Military Defence (MD), Castle Defence (CD), and Psychological Defence (PD). Sharks +1 PA, MD sharkfin gumbo Shark-Tooth Grin - Boosts military attack and defense in Bastille Battalion. Lava +1 MA, CD boiling broth Boiling Determination - Boosts castle attack and defense in Bastille Battalion. Truth Serum +1 CA, PD interrogative elixir Enhanced Interrogation - Boosts psychological attack and defense in Bastille Battalion. 1st place gets Bastille Battalion Fondue Trophy - untradeable item that can be autosold for 20k meat. Top 5 get Bastille Battalion tattoo kit - gives the bbattat tattoo. Top ? get Bastille Battalion cheese wheel - a usable item that lets you specify your favorite cheese in your profile. System Message: Bastille Batalion will now give rewards on your first play and... maybe remember your settings from game to game. This page was last modified on 6 April 2019, at 04:31.